Connect across your office or across the country. Voice, video and data are critical parts of your business. PMT knows the importance of ensuring you have the right structured cabling and network infrastructure in place with the utmost in service and support. In order for your business to be successful and thrive, the voice and data networks must be scalable and flexible, giving necessary support for your future growth. 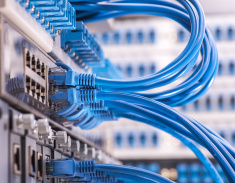 PMT provides voice and data cabling installation services for companies of all types and sizes. Our expert and certified staff stay up to date with all cabling and communications standards and technology advancements to make certain you can trust the results our techs deliver.